If you were around some time ago, you may recall seeing that the planned US tech tree included some tanks labelled ‘Yoh’ around the higher tiers. They’ve since dropped off, but that’s not important right now. Well, I like a challenge, so I went hunting. The first thing I did was to call the H.L. Yoh Company of Pennsylvania themselves, to see if they happened to have anything in the company archives. The first difficulty was in verifying that I had, indeed, reached the correct company. You see, if you go to their website today, you find that they are a human resources provider.  They provide staffing for your company’s needs. Not very much in there about construction or production, let alone tanks. There is now a history section of the website (there wasn’t at the time), which does reference some engineering work way back in the 1940s through 60s, but without even that link, all I could do was pick up the ‘phone, dial the number, and start asking around. Nobody seemed to know anything about the H.L. Yoh Company’s military past, though certainly nobody working there could tell me that they hadn’t had one either: Nobody had been around that long. They certainly didn’t have any knowledge of any old tank designs sitting around the back shelves anywhere. As a result, when I was in the Archives some time ago, I kept an eye out for anything which seemed to be Yoh-related. Two items were found in the classified sections from the 1950s. One was a fairly benign (and hefty) document assessing the ergonomics of a certain SPG, the other I found to be far more interesting. An FOIA request saw the binder de-classified three days after I left the Archives. Suffice to say that on my next return, it was the first thing I scanned. In presenting the following special features, we have concentrated on the vital elements of a medium tank’s function. Each of the ten features is capable of being further developed into a practical and efficient component. Most of the proposals may be readily adapted or modified to permit their incorporation into the present day tank. Now, here's the odd thing. A number of the below proposals are described and even shown (small) in the Hunnicutt book. But in order to see the binder in the Archives, I had to have my security clearence verified and then be granted access to the classified reading room in the Archives where, of course, no reproduction equipment is authorised. Why they were still classified can probably only be put down to bureaucracy never declassifying them, but classified they still were. How did Hunnicutt get them printed? Of course, the man has been dead some years now, and I'm unlikely to ever find the answer. We can start off with one of the more sensible proposals. 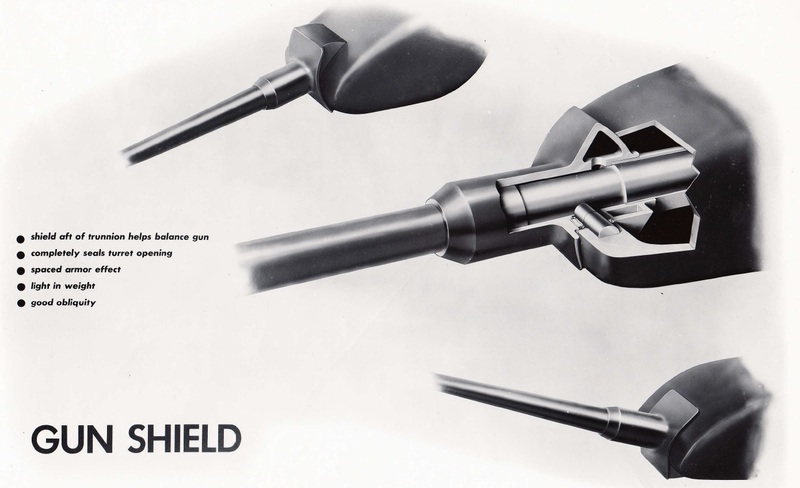 The new gun shield incorporates many desirable factors. 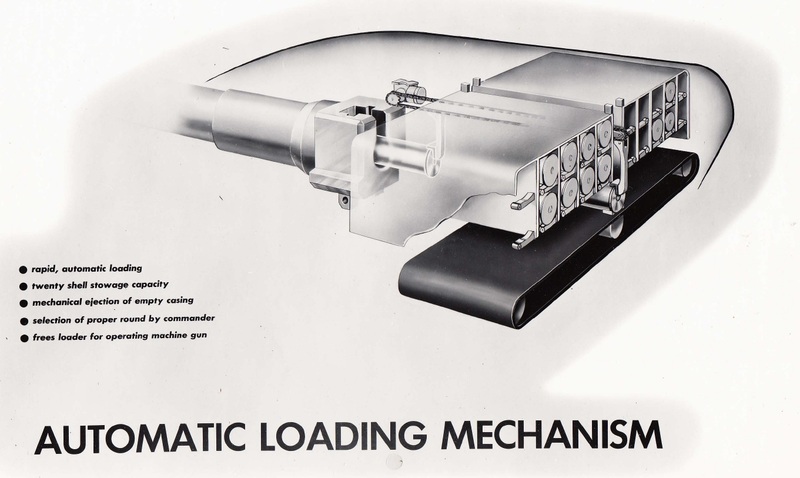 The primary feature consists of the weight being concentrated aft of the trunnion, helping to balance the gun. The shield is composed of a light weight cored casting, to which the gun cradle is attached, permitting the gun to recoil. The sloped front provides excellent obliquity. The turret opening is completely sealed by the unique contour which maintains a minimum gap between the shield and turret. An ammunition grab has been developed in an effort to provide the simplest possible kind of assistance in lifting heavy shells. The grab is held in the loader's left hand, leaving his right hand free to guide and control the movement of the round. All controls for the hoist and grab are incorporated in the grab itself. Squeezing the latch, grips and locks the grab on the shell. Pressure is released by squeezing the trigger. The grab may also be used to replenish the ready racks. When not in use, the grab may be compactly stowed near the turret roof. Although I’m OK with the concept for, say, larger artillery shells, I’m unsure that this is in any way faster than traditional manual loading of what seems in the image to be a 90mm round. The other concern I have is that the clamp be tight enough to prevent the round from slipping, but not so tight as to deform the shell casing and prevent it from being chambered. Suggestion #3 is an armoured ready rack. This method of stowing the "Ready" ammunition offers maximum safety to the crew. 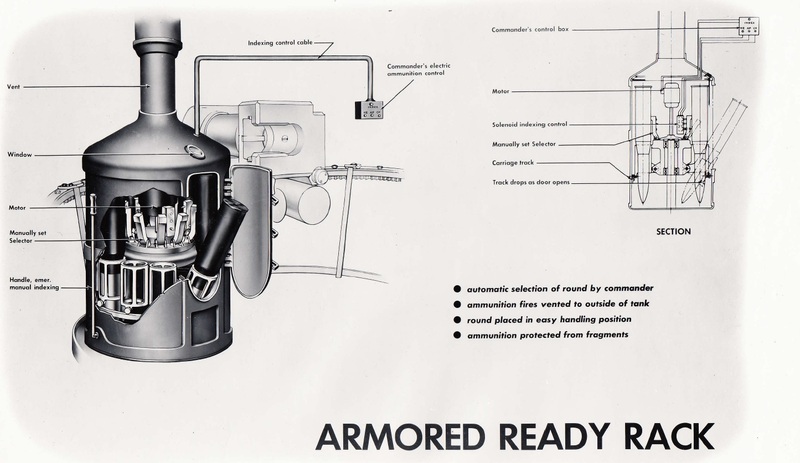 It eliminates the fire hazard thru which 90°/o of the tanks were lost in World War II. The device will prevent fragments from striking the ammunition. If a projectile does enter the rack, the resulting ammunition fire would be vented out of the tank, saving crew and equipment. In addition to the protection feature, the commander can select the proper round by remote control. The loader receives the round in a position that allows ease of handling. The idea is sensible enough, and indeed, as a concept it bears a fairly reasonable similarity to the revolving ready rack/semi-autoloader currently in production on the Merkava IV tank. On the downside, it seems to take a lot of room inside the turret, I think the diagram understates things a bit. Also unsure if the hatch truly will be strong enough to divert an ammunition explosion up through the bottleneck chimney. Still, interesting example of thought. A couple of autoloaders are suggestions 4 and 5. The bustle autoloader is most sensible, and indeed bears a good resemblance to the cassette autoloaders found in modern tanks. The only difference seems to be a gravity feed to the conveyor belt. This proposal indicates a method of loading the gun automatically. 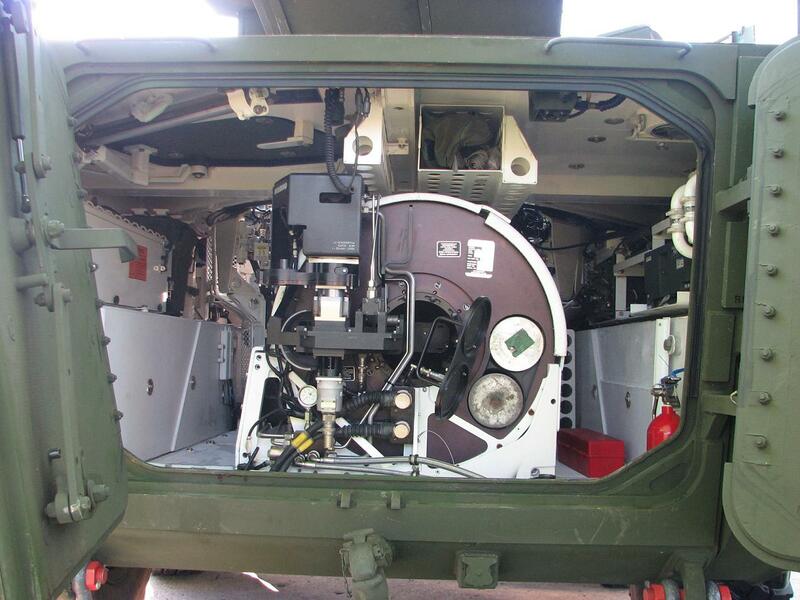 Eighteen rounds of 105-mm ammunition are stowed in the mechanism located in the "Bustle" of the turret. The commander presses a button indicating the desired type of ammunition. A tray then receives the round from the storage compartment and conveys it to the center of the gun. A pushing arm rams the round into the breech and waits above the breech for the gun to be fired. After recoil and shell ejection, the pusher reverses and discards the empty casing out of the tank, coming to rest in a position to receive the next round. 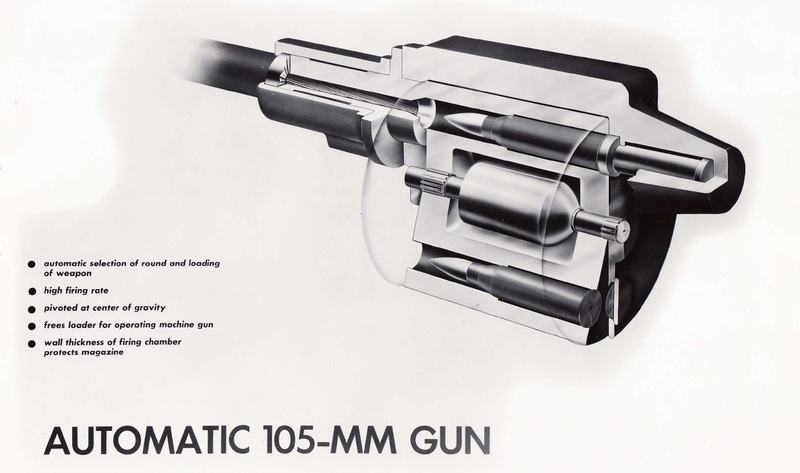 A revolving magazine houses the necessary rounds of 105-mm ammunition. 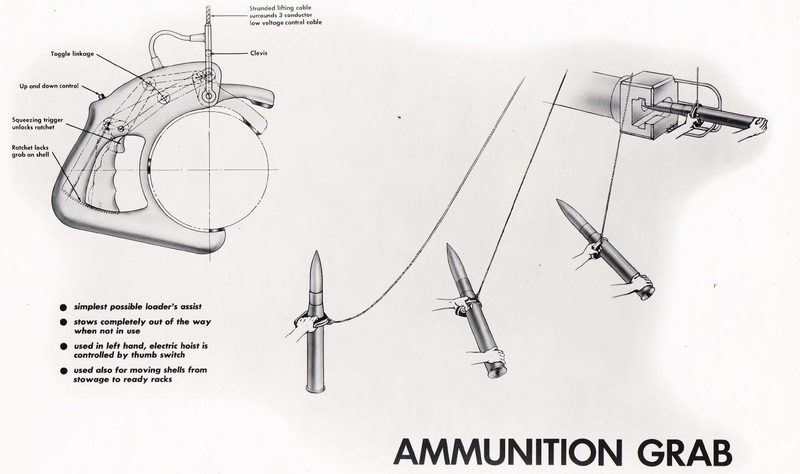 By remote selection, the magazine indexes until the desired round is in line with the gun. A plunger, housing the firing mechanism, then moves the shell into the gun tube and locks to provide obturation. As the projectile moves forward when fired, it passes a port permitting gas pressure to unlock the breech plunger. Some of the remaining gas pressure forces the empty casing back into the magazine with the breech plunger behind it. The gun is then ready to receive the next round. This also strikes me as being something likely to take a significant amount of room. The round revolver in the Styker MGS isn’t small. Perhaps the most pressing problem is that it looks like the entire revolver is permanently affixed to the gun, thus adding to the gun’s overall weight (and difficulty in moving it), and of course, the amount of room it needs to move up and down. That may be something which can be fixed by adding a sliding block system, but we’re still looking at a lot of room. Unsure how gun recoil is supposed to be handled, it looks like a zero-recoil system. Option #6 starts to get a little silly. 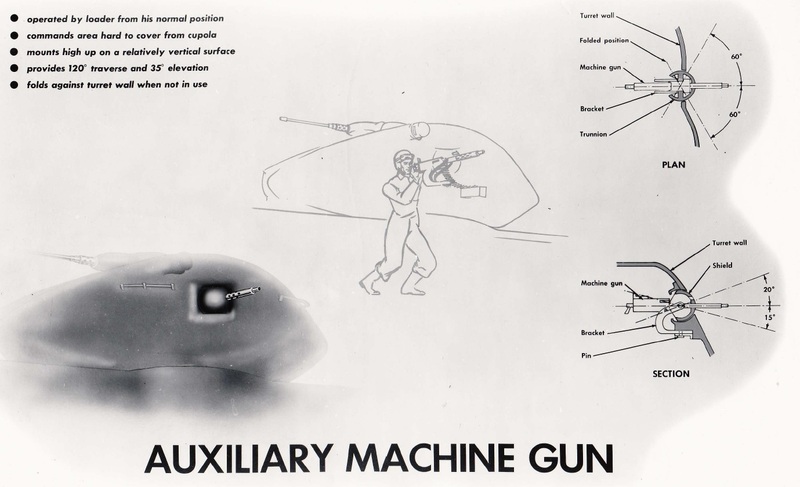 From a study made of the functions of each member of the crew, it was determined that the loader is best suited to man an auxiliary machine gun. This arrangement indicates that the gun will not interfere with the normal duties of the loader, due to the fact that it may be out of the way. When in use, the gun can traverse 120° and elevate 35 °, covering the left side of the tank. Protection from frontal attack is offered by the turret itself. This proposal permits freedom of gun movement, plus ample protection from bullet splash. 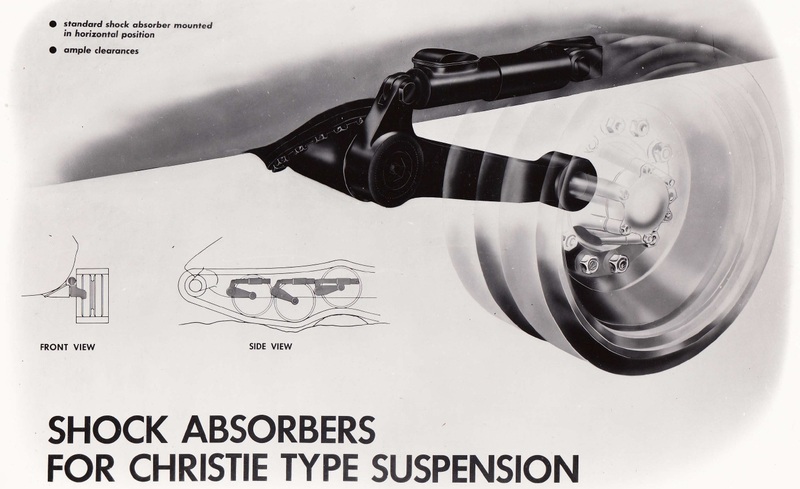 Unsure if they specifically meant ‘Christie suspension’, or if it was just an early example of misusing the term to indicate individually sprung roadwheel arms. If the former, it’s pretty much redundant as Christie had been long discarded, and if the latter, events have shown that the horizontal shocks weren’t required. The "Track within a Track" is a method of applying power to the bogie wheels in an emergency. It is mounted between the rear three wheels and the main track, and is driven by the main drive sprocket. It is available at all times in the event the main track is thrown, damaged by a land mine or subjected to enemy fire. When the main track is lost it will be unnecessary for the crew to expose themselves while making repairs. Its additional weight is negligible. If it is the means of saving the crew and tank the cost would be insignificant. I am somewhat amused by the assumption that when the track is broken that the various pieces of suspension etc will be flung clear and that the ‘inner’ track will simply allow movement without restriction. I can think of a lot of ways that the ‘full’ track could foul the system and require the dismounting of the crew before using the inner track. And if you’re going that far, may as well just short-track, though admittedly that’s more than a five minute job. Still, the track-within-the-track idea was far more sensible than the alternate proposal. 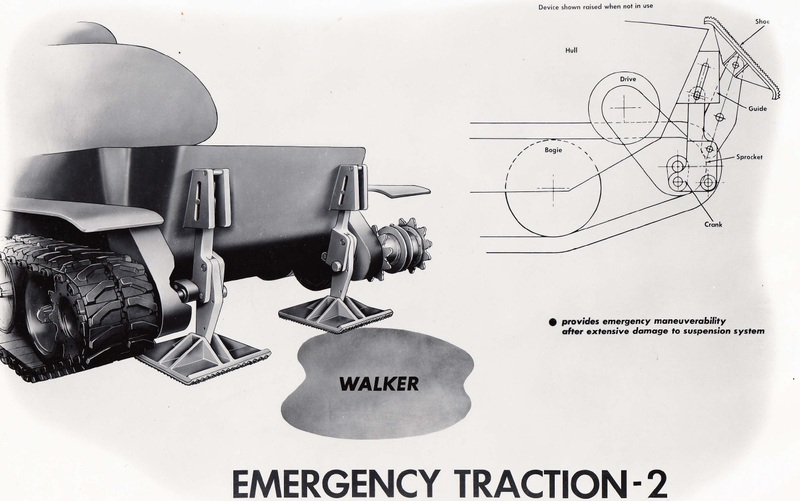 The walking device is an unconventional method for providing traction in an emergency. Each foot is powered from the same shaft as the main sprockets and may be driven independently in either direction. 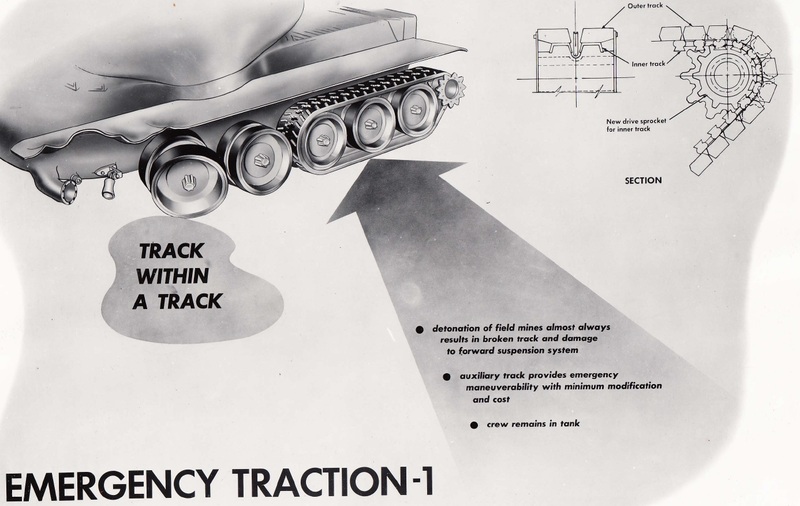 The device is engaged from within the tank when track damage occurs. I like the way they describe it as ‘unconventional’. ‘Looney’ is more likely. Still, I have left my personal favourite for last. So let’s see… you’re adding another ton or three of weight for the turret motors to worry about, and centre of gravity is going to be ungodly high. But what really grabs my attention is the concept of the better part of a thousand horsepower being transmitted by way of an independently-rotating double-sided gear ring under the turret traverse gear ring. In addition to the sheer bizarreness of the idea, the other thing that I am curious about is the problem of the torque trying to push the turret in the other direction. There’s going to be some significant power loss compensating for that, methinks. I’m all for creative thinking, but there’s probably a reason that the Army never requested the H. L. Yoh company to build anything. The Chieftain is Wargaming America's resident tank guru. If you'd like to stay abreast of his comings and goings, feel free to "Like" The Chieftain on Facebookand follow The Chieftain on Twitter. 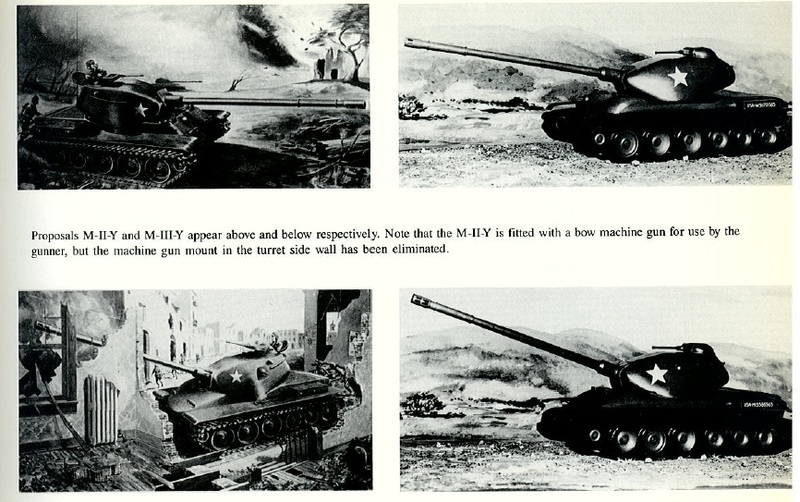 I wonder if they actually consulted with any tank crews when they were going through this design exercise? Can you imagine the stunned silence when the crew is told.. And you'll be sitting way up here, next to an engine that is connected by the noisiest gear arrangement we could come up with. Oh I forgot to mention you'll be sitting on top of 60 rounds of Ammo right next to the fuel tanks! I can see why they didn't put this in the game, would be hell to balance those tanks. Edited by SdKfz252, Feb 02 2013 - 20:35. As crazy as it sounds I could see a purpose for that last one in a CBRN environment. After all wasn’t that one of the reasons why oscillating turrets were looked at, so less of the tank had to be sealed. Or in this case the engine can at least be worked on under some form of cover. Then again it looks like a Rube-Goldberg way of making your maintainers and loggys hate you outside that one requirement. first i want to know how adding a giant motor in the turret provides "4. Adequate turret space for crew"
second. doesn't it look like one of those old 50's "flying car" models? and finally where was the ammo stored again? in the hull? in the Franklin stove thing?... how is it getting to the gun? Not really. You've got oscillating turrets the wrong way around - it wasn't easy to seal the large seam around the oscillating bit, so they were dropped. In that vehicle there would be a firewall between the crew and the engine (engines in the crew compartment has been a bad idea ever since WW1) and the space around it taken up with fuel tanks. If anything it would be much harder to work on, you'd need to lift spare engines much higher and you'd need panels in the thicker turret armour to get to it, which would be harder to manage. Thanks for the great article. It's always interesting to look back on the designs of the past and see the "creative" solutions they came up with. Those "walkers" are hilarious. Please keep up the good work. As always, very informative, and in this case, good for a chuckle. The turret the bustle autoloader is in looks like the one on the T57. Is there a connection there? Wow... now THIS is a good research. As an engineering enthusiast, I'll be reading through these lines as soon as I have some time. Thanks for sharing, this research worth its weight in gold. I have been playing this game since the beta. i thought this was just a game never thought there was that much to it. nice research thanks for sharing. I think that these proposals were kept classified for a reason and not bureaucratic oversight. The reason? Embarassment. So why aren't any of the features used in the MBT-70? Too expensive or too much for the crew to handle? I know that the MBT-70 project was dropped because it required too much training for the crewmen.